China’s Red Empire — To Be or Not To Be? China Heritage Annual 2019 takes as its theme Translatio Imperii Sinici — the transfiguration of China’s imperial power, politics, mindset and culture throughout the modern era. The title is an adaptation of the medieval Latin term ‘translatio imperii‘, literally ‘the transfer of the power or authority to rule and command’. This expression was used to describe the inheritors of the imperium, or power to govern, of the Roman Empire in Europe. Over the centuries, the inheritance of imperium, and the charisma, as well as the grandeur, of the Roman Empire was avidly sought after by many towns and states, as well as being vied for by the Holy Roman Empire, France, Britain, among others. In 1915, Yuan Shikai, then president of the Republic, dissolved the state and established a new dynasty, The China Empire 中華帝國. He chose as his seat of power the Lake Palaces, Zhongnan Hai 中南海, a series of lakes girded by pleasure parks, pavilions and office buildings along the western flank of the Forbidden City in the heart of Beijing. Regional military strongmen immediately rose up to oppose the new empire; there was also widespread public outrage that the burdens of the dynastic past, which weighed so heavily on the new republic, could be crush the country. Yuan’s rule was short-lived, although a year later loyalists attempted to restore the fallen Qing imperial house and, in 1932, the ‘last emperor’ 末代皇帝, Henry Aisin Gioro Puyi 愛新覺羅 · 溥儀 ascended the Dragon Throne in Changchun, renamed Hsinking 新京 (しんきょう), the capital of Manchukuo, the territory of which was carved out of the north-eastern provinces of the Republic of China by an occupying Japanese army. Two millennia of dynastic rule had bequeathed to modern China a rich corpus of imperial practice, language, ideas and stratagems. Following the establishment of the People’s Republic of China in 1949, Mao, his comrades and their propagandists consciously employed imperial metaphors and made grandiloquent gestures familiar from the country’s past. The Party Chairman was also an avid reader of historical works and classical texts and he masterfully applied what is known as 帝王之術, perhaps best translated as ‘the dark arts of the emperors’, to manipulate his comrades and dominate the Communist Party. This imperial aegis was not limited to the territory of China. The Communist Party saw itself not only as leading the revolutionary transformation of an ancient land and, after what they regarded as a series of unalloyed successes, Party leaders, in particular Mao, formulated a global role for Beijing. As scientific socialists who believe that they were fulfilling the inexorable promise of history, they were confident that Beijing was at the centre of an unfolding world revolution. Despite its impoverished economy and long-suffering populace, the People’s Republic launched itself into a fitful competition with the Soviet Union. 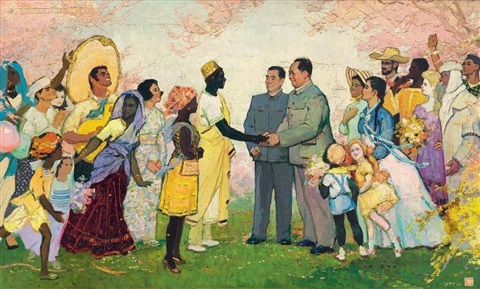 Efforts were made both to export Mao Zedong Thought and its model for revolution as well as to build up a global alliance of what Mao would eventually call ‘Third World Countries’ in Asia, Africa and Latin America, or 亞非拉 in the shorthand of the time. The strategy was summed up in the seemingly anodyne formulation ‘We Have Friends All Over the World’ 我們的朋友遍天下. This Mao-era enterprise, along with an expanded ambition, not to mention a much stronger economy and military, has been considerably reinvigorated under Xi Jinping (one should point out that it was hardly in abeyance during the Deng-Jiang-Hu decades). Given the post-dynastic history of twentieth-century China, therefore, it is hardly surprising that, to this day, people are alert to and wary of what is known as ‘the imperial mindset’ 帝王思想. provides substance and diplomatic architecture to the revived concept of All-Under-Heaven or tianxia 天下, one which assumes a belief that China can be a moral, political and economic great power. This would not be linked to the ancient Chinese empire. Instead, China could be viewed as a large multinational state that accepts the framework of a modern tianxia based on rules of equality and sovereignty in the international system today. As a result of China’s meteoric economic growth over the last decade of the twentieth century and the first decade of the twenty-first century, however, and with its startling accomplishments in pulling such large numbers of its own people out of poverty, other countries began calling for Beijing to drop its arm’s length stance toward fuller participation in the international community, ease its suspicion of multi-lateral organization, and begin ‘stepping up’ to its responsibilities as a ‘major power’ in global affairs. Along with this, however, at least in some quarters of the English-speaking world, there also surfaced disquieting intimations and alarms that any future aspirations as a global player China might pursue would be bound to turn out to be imperial ones. And true enough it is, that when Xi Jinping and other Party leaders today call for the ‘rejuvenation of the nation’, what they plainly seem to want to bring to mind is a time, before the Party had been born and before the nation had been built, a time of empire: when China stood as an economic, technological, and cultural colossus, at the cosmopolitan core of immense networks of production and trade, skills and learning—admired, envied, deferred to—and governing within its own realm, entirely according to its own lights. Gullible members of the international media, some foreign governments and many business people and fellow-traveller academics, play the role of unpaid propagandists when they promote the risible ideas expressed by Xi Jinping, that is the fallacy that throughout its history ‘China’ was basically peace-loving and non-expansionist. These conceits reflect a carefully honed official line developed by the Communists from their first attempts to manage, and massage for its purposes, Chinese history in the 1930s. Controlling the narrative, creating shorthand verbal formulations that encapsulate Party policy, imposing Party ideas on ‘influencers’, getting the message out via the apparat, manipulating the media as well as a full spectrum of foreign friends — these are all aspects of what under Xi Jinping is called The China Story 中國的故事. It has been an effectively strategy employed by the Communists since the Yan’an era (1935-1948). Today, as they promote an ahistorical view about dynastic China, empire and their own party-state, they also rely on sympathetic freelance supporters. The concepts of ‘kingly rule’ 王道 and ‘hegemonic rule’ 霸道, touched on in the quotation from Xi Jinping above, have featured in Chinese discussions of political power since before the first dynasty in the second century BCE. They are also crucial today as the People’s Republic of China positions itself for an ever-greater global role. Chinese officialdom frequently uses these terms, and Professor Xu Zhangrun 許章潤 of Tsinghua University, pointedly addresses the age-old dichotomy between kingly and hegemonic rule in the following essay. In particular, he asks whether China under Xi Jinping can, should or will be a ‘Red Empire’. In December 2018-January 2019, Professor Xu published a further series of three essays written to commemorate China’s era of ‘Reform and Openness’ 改革開放. The first two appeared in the online Mainland Chinese edition of Financial Times, the last was published online in Hong Kong. Over the coming weeks, we will offer annotated translations of that series under the title ‘After the Future in China, a Triptych for Today’. Below, ‘China’s Red Empire — To Be or Not To Be?’ is an excerpt from the third essay in that cycle of works. As the author could not find a publication venue on the Mainland, it appeared on the independent Hong Kong website The Initium. Xu Zhangrun is an admirer of Cicero, the Roman statesman, orator and lawyer. One of the noteworthy forms of public appeal in ancient Rome was the Provocatio (prōvocātiō), a speech or document issued by a plaintive or their spokesman to challenge an order, coercitio, by a magistrate. Xu Zhangrun has commented that he thinks of this recent series of three essays as his version of a Provocatio. In traditional terms, these three lengthy feuilleton could perhaps be called 策論 cè lùn, a genre that combines advocacy with warning. From the time of its appearance on 16 January 2019, the bilingual version of ‘China’s Red Empire’, excerpted and published below, was widely distributed by readers in Beijing and throughout the People’s Republic. On the morning of Sunday 20 January 2019, Beijing Time, we were informed that online access to this essay on China Heritage had been blocked. We take this opportunity to acknowledge the unimpeded circulation on the Chinese Mainland first of China Heritage Quarterly from 2005, the publications of The China Story Project (Journal, Yearbook, etcetera) from 2012, and of all the articles published in China Heritage from 1 January 2016 up to 20 January 2019. We are glad that, for some fourteen years, Mainland readers have enjoyed unimpeded access to all of our publications; it would appear that China Heritage has joined the distinguished ranks of others who are ‘screened from view’ 被屏蔽. The following material has been selected from the full text — one that is over 10,000 Chinese characters in length — with the author’s permission. Due to the often elliptical nature of Professor Xu’s style, which favours an admix of literary and modern Chinese, along with gibes and colloquialisms, the translator has where necessary added explanatory material, marked by brackets [ ]. A full, annotated translation of the text will be published in China Heritage along with the two other essays that make up ‘After the Future in China — a Triptych for Today’. All three essays are offered both as Lessons in New Sinology and as chapters in China Heritage Annual 2019 — Translatio Imperii Sinici. For some time now the People’s Republic of China has been enjoying an inexorable rise as a great power with a civilisation renewed. Finally [after 150 years, history has] dealt a great hand. But, from 2018, things have taken an ugly turn and the nation’s fortunes seem on the wane; it’s as though everything is going downhill and people are understandably anxious. The evidence for the downward turn abounds: despite that good hand, China now seems to be playing a lousy game, finding itself beset by problems both at home and abroad. There’s even chatter that people should psychologically prepare themselves for ‘hard times ahead’, as well as possible ‘military clashes’. Gossip is a barometer of the times. What’s going on? How have things reached such an impasse so suddenly? Putting aside for the moment all the factors related to the Global Great Game and the shifting epicentre of world power along with everything that means, if one just focusses on China itself it’s not hard to shaft home responsibility for the present state of affairs to [the party-state] setting the nation on what would appear to be a course to become a ‘Red Empire’. There’s even an impression within the general public that China is pursuing the idea of Empire. Along the way the country is courting enmity in every direction and generating opposition from all quarters. The greater the rhetorical clamour, the more precipitous the decline in the nation’s reputation. On one hand, China’s political system has developed in such a way that it has scant wriggle room, nor does it now have the wherewithal to offer the public the kind of largesse or support-winning concessions of the recent past. Moreover, because of a general anxiety that the whole show may well come apart at the seams, there has been a ratcheting up of political repression. Then, on the other hand, the vaunted ‘Original Intent’ [part of a slogan about the Party’s historical mission first used by Xi Jinping on 1 July 2016] of the Communists to rule forever is now further entrenched and [the Leader] has carved out a forward path on the basis of what is essentially the usurpation of party-state power [a reference to the amassing of power by Xi Jinping and the ‘terminal tenure’ granted to him in March 2018]. As conflicts intensify and pressure builds by the day — and grow because those in power don’t want to confront substantive issues [that require attention] — they have decided to backtrack [that is, revive aspects of pre-Reform Mao-era policies]. Their behaviour only serves to whet further the party-state’s totalitarian appetite, it also adds to the sense among the public that you really do want to become a Red Empire. Be it either inside or outside the system, at the very centre of power or merely on the periphery, everyone is completely aware of what is unfolding and [if this is indeed the way forward] there will be no turning back. No one quite expected that China, a country still on the path to modernity, would end up here. But then again, what is now unfolding is not entirely beyond the overall logic of history. In this writer’s opinion, even if China today is a Large-scale Totalitarian Power, it has not been, needs not become, should not and cannot itself be a Red Empire. However, because of the country’s sheer size and scale, it has both the potential, and even a propensity, to become one. That’s why I believe that it is a matter of urgency for this country to focus once more on what is integral to its modern development — a process of change that has unfolded over a period of one and a half centuries, and one which embraces the political aspirations of myriads of people [this is the theme of the first essay in this three-part series, which will be published in an annotated translation over the coming weeks]. China should take stock, shift gear and truly work towards becoming a People’s Republic, one that is underpinned by constitutional governance and democracy. To do so is both in the public interest and a matter of collective redemption; it is also how this country can truly contribute to lasting world peace. There should be no more procrastinating. Just a Large-scale Totalitarian Power? During the twentieth century, the contestation between the United States of America and the Soviet Union was a clash between two forms of extremism, a take-no-prisoners pitched battle between two versions of modernity. It was also an extrapolation of the life-and-death struggle between what one could call [in traditional Chinese terms] the ‘Superior Way’, one that championed Freedom and Good Government and an ‘Inferior Path’, consisting of Totalitarianism and Merciless Governance. The Soviets inherited the expansionist tendencies of Tsarist Russia and, by means of sheer brutality and the prosecution of unjust wars, it was able to establish an empire that straddled Europe and Asia. Domestically it [the Soviet Communist Party] combined the formidable power of the one-party state and the authority of a Supreme Leader with a political dogma that was treated like holy writ to wage a vicious war. Pursuing the logic of [what Mancur Olson called] ‘stationary bandits’ [to extract wealth from its subjects over the long term] to subdue and remake the state. With his control over the KGB and the Party apparat the Supreme Leader was able to manipulate the nomenklatura and the whole bureaucratic system. In turn, the party-state dominated every aspect of society and developed a massive machinery of control organised in a top-down, hierarchical fashion. In the process, it [the Soviet state] gave itself absolute authority and declared that its actions were determined by the iron-clad laws of history. Under this regime Rule by Falsehood and the Annihilation of Belief were taken to their logical extreme and in the process a political credo that promised the withering away of the state created in its stead a party-state which evolved into a nation that was effectively colonised by a one-party dictatorship. Pursuing a ruler-centred politics that then sidelined the state itself, the Soviet Union became a behemoth with a thirst for totalitarian control that could not be slaked. In its relations with other countries and within the evolving world-system, the Soviets pursued a traditional form of imperialism [following Moscow’s invasion of Czechoslovakia in 1968, China called it 蘇修社會帝國主義, ‘Soviet Revisionist Social Imperialism’, or 蘇修 Sū xiū for short]. Availing themselves of conquest and through political coups they built a Red Conglomerate that traversed East and West. With the Warsaw Pact countries forming the imperial core, the Soviet Union oversaw the growth of a global system of control that linked its centre with an international periphery. After 1949, China for a time unfortunately allowed itself to become a part of the peripheral reaches of this system [resulting from the Sino-Soviet Treaty of Friendship, Alliance and Mutual Assistance signed between the Soviet Union and the People’s Republic in 1950]. Finally, because of a host of factors — native historical-cultural resistance, the particular personality of the leader [Mao Zedong], along with geopolitical considerations — China and the Soviets parted ways acrimoniously, a split that nonetheless had a felicitous impact on the eventual Sino-US rapprochement in 1972. The intermingling of global imperial ambition with a vision of a worldwide red empire was an odious and fearful thing, a murderous regime that was a threat to humanity. Because of it, first and foremost, the people of the Soviet Union suffered the calamity. As for the Soviet Empire: it was born in injustice, and ended in opprobrium. Today, even the thought of that Red Empire makes one shudder. The demise of the Soviet Union left the United States as the sole world superpower. Through a covert form of American Imperium it built and maintains the World-System. It was an imperium that enjoyed a decade of relative glory in the wake of the Second World War, and its salad days continued up to the time of the collapse of the Twin Towers on 9/11. Whether we consider the former Red Empire of the Soviet Union or the Empire of the Free World, it is evident that, by comparison, Modern China has not been, needs not become, should not and cannot itself be a Red Empire. In the first place, modern China has never been an Empire. Following the 1911 Revolution, the dynastic Qing empire was transfigured to become a nation-state. By that time, not only had the Chinese cultural world that extended through East Asia thereby making China an imperial presence in the region [and influenced the cultures and politics of Vietnam, Korea and Japan, among others] all but disappeared, but great swathes of its borderland territories were lost. For the next forty years [from 1912 to 1949], warfare and internecine divisions left the country both much reduced and widely scorned. When the Red Rulers took charge in 1949 and restored unified rulership, in the process they imposed a proletarian dictatorship and instituted a policy of relentless class struggle. This resulted in a pitiless totalitarian state. Overseas, first they split with the Soviet Revisionist and then they attempted to export their form of revolution to South-east Asia, while also lavishing aid on friends in Asia, Africa and Latin America [under Mao and Zhou Enlai China developed a strategy for cultivating relations with former Western colonies to create a ‘Great Unity of the Peoples of Asia, Africa and Latin America’, later called the ‘Third World’]. Such gestures of bravado were only possible because the rulers were exploiting their own population; but, even then, the potential of the Maoist regime was hamstrung [by domestic economic policies that effectively impoverished the nation]. The most it achieved was to wedge itself unenviably in the interstices left by the two hegemonic imperial powers. They couldn’t even break out of the First Island Chain [that is the islands at the edge of China’s ‘maritime border’ from the Kuril Islands, Japanese Archipelago, Ryukyu Islands, Taiwan, the northern Philippines and Borneo from the Kamchatka Peninsula to the Malay Peninsula]; moreover, the northwest borderlands were effectively completely sealed off [by the Soviet presence]. Mao’s China may well have aspired to be a hegemon [Mao famously declared that while China should prepare for war with the Soviet Union it would never be a hegemon, although in reality he harboured both regional and global ambitions], one that could extend itself and its influence, but it fell victim to its own vacuous dreams of ‘making the whole world red’ [that is, supporting revolutionary struggles around the globe]. It simply never had the resources to achieve its hegemonic goals and at best could only ever enjoy a measure of satisfaction by championing Mao’s theory that the globe could be carved into ‘Three Worlds’ [a theory that Mao articulated in the early 1970s]. Finally, [following Mao’s death] it had no choice but to start over, acknowledge reality and clean up the mess. [This is elaborated at length in the first of Professor Xu’s three essays, ‘Humble Recognition, Boundless Possibility’ 低頭致意, 天地無邊, the annotated translation of which will be published by China Heritage.] The country only just managed to made it out of the Cultural Revolution in one piece and in the aftermath there was simply no room for Imperial Designs. After all, [for decades] the country had been bound in a straight jacket of totalitarian-generated poverty. And, now, here we are with the Belt & Road Initiative unfurling o’er sea and land, aided and abetted by an Asian Infrastructure Investment Bank that’s been up and running for some time now. Despite these, the existing global system remains unchanged, and unchanging. China’s grand moves are all part of an effort to come up with something particular and new in the face of the pre-existing order. Superficially, it might look all bright and shiny, but in reality China is still a second-order economic power that has been pretty much forced to launch these measures for the sake of its own survival. This is all a far cry from becoming a ‘Red Empire’. After all, if such an empire really were to come into being, it would have to assume real responsibility for overseeing global regulation [both of the bodies it chose to create and those with which it was involved]. Imperial gestures and feints cannot obscure the fact that, ultimately, the Chinese system is obsessed with self preservation. Domestic political considerations far outweigh what on the surface appears to be an expansive global mission. Yet, none of these moves [overseas] are a logical extension of core national interest. Certainly, they satisfy the needs of the dominant political party [the Communists], but they hardly reflect any national logic. As for the will of the people: none of this has anything in particular to do with that. You might put out willow branches [an ancient custom signifying good fortune], but they won’t necessarily sprout trees that can provide real shade. Even less [will these new institutions really] create a matrix for an imperial-like presence. Moreover, there is no need for Modern China to become a Red Empire. Generally speaking, empires both past and present were possible because of a combination of geopolitical and climatic factors, along with mass mobilisation and grand narratives that worked together but were led by self-interest. That was the case both with the Roman and the Ottoman empires, as well as with the British and the more recent American Imperium. Perhaps only the Soviet Union, driven as it was by [Marxist-Leninist-Stalinist] ideology, was both economically rapacious while also paying heavily for its imperial reach. Eventually, such folly led to its downfall. In its quest for profit today China has no need to pursue the arrant willfulness of empire; it can achieve its goals by being enmeshed with the open economic structure of the World-System, it can act as a powerful adjutant through free and equitable trade. For the decades up till the present [era of Xi Jinping from 2013] China through its actions humbly acknowledged these possibilities and earned a pretty penny for its efforts. If it is now to act in a contrary manner, not only does it give others the pretext for opposing it, but it will also generate resentment in all quarters, and to what end? Moreover, empire comes with responsibilities, something summed up in the expression ‘Burdens of Empire’. For China, a polity that itself is not yet truly modern — it lacks a reasonable political system — now to take on hefty responsibilities of the kind demonstrated in the foreign aid lavished on other countries in the Mao era, and more recently featured in the massive ‘cash splashes’ of the present incumbent — the People’s Republic will in effect [to use a colloquial saying] ‘be giving itself an extravagant appearance of greatness merely by battering its face until it is swollen’. Such behaviour goes against National Rationalism as well as being in contravention of Popular Rationalism. This is neither wise nor felicitous. Again, to what good end? The public regards those impressive ‘cash splashes’ [in foreign aid doled out by Xi Jinping, a topic featured in Professor Xu’s July 2018 Jeremiad] to be offensive; they are a topic of constant nationwide disquiet. Of course, it is not hard to predict that this kind of extravagant gesture will perforce be curtailed due to the ongoing deterioration of the Chinese economy. In the third place, China should not be a Red Empire. After all, from a broad historical perspective the main tenor of Chinese civilisation is one that favours Righteous Government rather than the Rule of the Hegemon. Imperial ideals are no longer germane to this world. The military ventures of Emperor Wu of the Han dynasty and Emperor Yang of the Sui exhausted their subjects and squandered the wealth of their kingdoms. As a result, both men have been scorned throughout Chinese history. Or, to consider a more recent example, the idea of a Red Empire flies in the face of [what I have described elsewhere as] China’s Modern Historical Awareness and Political Aspirations. China’s quest for ‘Wealth and Power’ [starting in the late-nineteenth century] was about independence, not hegemony. The pursuit too of ‘civilisation’ and ‘democracy’ were about improving the political landscape of China itself and enabling the commingling of our culture with that of the rest of the world. This has little to do with imperial intent, let alone ‘Red Empire’. To mount the spectacles of prosperity, expenditures must necessarily increase and with that the tax burden on your people. Such impositions will cause great suffering which, in turn, may threaten the state itself. Once the state is thus threatened, its ruler may well fall. It’s ancient prediction with contemporary relevance. As for differentiating between friends and foes on the global scene, such determinations needs must reflect rational national self-interest and one’s own political maturity. These things serve domestic politics just as they are determined by domestic politics. Only a crazy man would want to create unnecessary problems for himself and his country. And now to my final point as to why China cannot possibly become a Red Empire. New China has its origins in [the Xinhai Revolution of] 1911 [and the founding of the Republic of China in 1912], it went through 1949 [the establishment of the People’s Republic of China] and then ‘1978’ [when, at a Party plenum, the policies later known as Reform and Openness were initiated]. For over a century this country has, overall, been doing its best just to survive. It is only in the last decade or so that the Chinese have really had the wherewithal to enjoy something like the good life — enough to eat, some spare cash to spend; even grifters and crooks have got a taste for new opportunities. As for that talk about ‘The Age of Independence’ [under Mao], ‘The Age of Wealth’ [with Deng, Jiang and Hu] and ‘The Age of Power’ [under Xi Jinping], all of that is only meaningful relative to the nation’s feeble and impoverished past. In a global context, the Chinese are still poor and hard-pressed; our culture is in deficit; we could never hold our heads high in the past, and have not enjoyed much wealth; true prosperity still lies in the future. This country has neither the wherewithal to maintain a military presence world wide, nor has it established any replacement organisations that can offer the world significant public goods [in the manner of pre-existing global bodies]. Empires are organised according to a system of ‘core and a periphery’, along with liminal bordering zones. China can boast no such thing. Furthermore, even if it is evolving a slapdash global operation system via its foreign aid projects and the Belt and Road Initiative, it has no way of effectively manipulating it [for particular purposes]. Just look at what’s unfolding on our own front door: there’s a constant state of tension all the way from the East to the South China Seas, a new Great Game is unfolding in these waters. It will be impossible for China to rest on its laurels, let alone enjoy the kind of deep water and distant ocean capabilities presently enjoyed by the American Imperium. That’s why I argue that given China’s present capacities, even if it did want to become a global hegemon and focussed its efforts in that direction, this country still doesn’t have the wherewithal truly to become a Red Empire. This is a pragmatic overview of how things stand at the moment. It is an understanding based on the long-term perspective of Modern Historical Awareness and Shared Political Aspiration, which I have repeatedly argued have been the [underlying and abiding] goals of Modern China. It is a quest that has taken the form of a search for ‘Wealth and Power, Democracy and Civilisation’. There was a period [of some thirty years, from c.1949 to 1978] during which Class Struggle was the dominant state policy [under Mao], but it was at complete variance with core Chinese civilisational tenets of Pacifisim, Rationalism and Human-heartedness. And that’s why those policies were decisively rejected [after Mao’s death and following 1978]. Speaking of the tradition, the concept of ‘All-Under-Heaven’ 天下 tianxia [which was both part of classical thought and dynastic practice] envisaged a territorial arrangement that allowed for numerous points of significance, it offered a kind of encompassing view that in its nature [even as tianxia is revived as a concept today] would be resistant to such wild imaginings as ‘Red Empire’. The moment one moves against this current of Modern Chinese History [that has to do with the country becoming a stable, wealthy and equitable nation] there will be a [popular] reaction. Recent events involving the regnant authorities have proven this time and again. Moreover, as I have stated in the above, today the people of China — the vast multitude of this country’s inhabitants — are finally enjoying the pleasures of sufficiency; they are far from being like the blind masses of the past. They are particularly affronted by the profligate waste of foreign aid, disgusted by the extravagance of leaders who are barely worthy of the name that is put on show in their pursuit of their ‘global vision’. Ever since Communist ideology collapsed the centre finds itself with no real belief system and, with each new leadership team, yet another political formulation has to be dreamed up. Over time these efforts are increasingly threadbare. ‘New Theories’, ‘New Thinking’ and ‘New Eras’ come tumbling out, one after another; they reflect the untethered nature of the system, its ideological dead heart, as well as the fact that true philosophical thinking about the state is itself in a state of suspended animation. All such ‘theorising’ is but a patchwork response slapped together in the most half-hearted fashion. What about all that hyperbolic talk about Confucianism, Nationalism or, for that matter, fin-de-siècle consumerism? None of it makes one whit of difference. If you are going to force people into silence, blind them to reality, hamper the natural and free growth of inquiring minds, and instead feed them a diet of a dated nineteenth-century Germano-Slavic dogma [ie, Marxism-Leninism], then all you’ll end up with is a nation of reduced intellect, a country that has crippled itself. That’s why you can promote your ‘Original Intentions’ [a major Party slogan inspired by the Communist Manifesto] as much as you want, but everyone knows that in matter of fact you are bereft of ideals. So, what’s left? ‘Defending the Rivers and Mountains [of China], Ruling over the Rivers and Mountains and Living off the Rivers and Mountains’ [for more on this see Ruling The Rivers & Mountains, China Heritage, 8 August 2018] — your credo is naked pragmatism, your policies blatantly opportunistic. In your heart of hearts you have no appreciation of moral worth or understanding of sincerity. And, as I discuss below, to be able to boast of cultural superiority you actually need to ground yourself in something real, vital and substantial. Who is going to really fight for an empire that is built on sand? The Grand Enterprise of Empire — including that of a Red Empire — hah! You know what: to get something like that up and running you actually might need a skerrick of, well, you know: Ideals! And maybe something approaching Sincerity. You simply gotta believe in something. Anyway, what I’m saying is that no matter what Modern China really is and what Modern China really will be, it is certainly not going to be realised in the form of Red Empire. Of course, this is beyond the comprehension of The One [當軸 dāng zhóu, literally, ‘the drive shaft’, that is, Xi Jinping], or maybe they are just pretending that they don’t get it? Nor, for that matter, is it something that the Old White Dude holed up in the White House on the other side of the Pacific can possibly imagine. As for the lapdog academics and media types who lavish all that verbiage on ‘the modern empire’, trying to make sense of their own nonsense, it’s all just too pathetic. To sum up, at the moment China is not so much a Red Empire as a Large-scale Totalitarian Power. However, in light of the fact that Beijing rejects political reform and resists building a modern political system in keeping with its actual social and political maturation — thereby refusing attempts to turn ‘China’ into ‘Modern China’ — and given the potential [of the power-holders] for overreach, China might actually become a Red Empire. That’s why the neighbors are obsessively speculating [about the way things are tending] and why the established powers are on edge. Meanwhile, you’ve got a clutch of Old White Mental Retards in the White House with their brutish ways who are dead-set on reviving a worldview that sees everything in terms of narrow, nineteenth-century-style national sovereignty. Their perceptions are heavily influenced by the power politics of the  Treaty of Versailles. As a result of their reckless behaviour they make Him [the Chairman of Everything Xi Jinping] feel as though he’s being cornered. What may well result is a ‘self-fulfilling prophecy’, something that will have the most baneful consequences. And here we have a government that is ‘taking a walk on the other side’ [相向而行, an expression used by China’s Ministry of Foreign Affairs, often in contradictory ways; here the author is satirising officialdom while using the expression to mean ‘to be at loggerheads with you’ and hinting at the popular Cultural Revolution version of contrariness summed up in an old quotation from Mao: 凡是敵人反對的我們就要擁護, 凡是敵人擁護的我們就要反對 ‘whatever the enemy opposes, we will support’, and vice-versa] and trying its best to distract people from focussing on its domestic political difficulties — regardless of whether the cost of these might end up being either a civil or an overseas war, something that is not far from the realm of possibility. It looks as though ‘Military Struggle’ or ‘a Great Patriotic Struggle’ [for more on this, see below] has top billing on the agenda and the possibility of things blowing up is increasing. That is because, although we have previously said that ‘only a crazy man would want to create unnecessary problems’. We unfortunately find ourselves in an era with ‘Two Old Red Guards in Power’ on either side of the Pacific. So don’t those ‘crazy men’ I’ve been talking about exist for real?! China’s Red Empire — a self-fulfilling prophecy? … …So, allow me to recap: how can a Large-scale Totalitarian Power that refuses to consider any meaningful kind of political reform, one that has no intention of establishing a constitutional democracy, not strike fear into people’s hearts? If it continues to grow both in power and in hubris who knows what might unfold? For that reason one must also predicate one’s thinking on the possibility, and speculate about the significance, of the rise of a Red Empire. This is a direct challenge to the post-WWII [ideal] model of nation states [as liberal market democracies], a model that was further affirmed in the wake of the collapse of the Soviet Union and Eastern Bloc. Real existential terror is not about concerns involving the militarisation of the South China Sea, or the global expansion of the Belt-Road Initiative or, for that matter, from ‘Made in China 2025’ and the spectre of a new colonial power. Of course, all of these things present challenges of one sort or another, but in their disparate ways they are also understandable when considered in the context of the growth of a major new power that is trying to plan a future on the basis of a rational calculus and national interest. Rather, the real concern is that the world must now contemplate the continued rise of a polity that is fundamentally totalitarian in ambition and one that is rapidly re-invigorating its internal governance to serve its particular ends. This is something that should unsettle the whole world; it is a reality that makes people ‘Worry About China’ both at home and abroad. At this crucial juncture, and just as I was writing this, the Peak [Leader, that is Xi Jinping] has repeatedly pronounced on the need for ‘Constant Struggle’, thereby sending out a dark message. At the start of the new year of 2019, numerous articles in the main official media touted headlines featuring the words ‘Constant Struggle’ and ‘Military Struggle’, causing widespread consternation. [For example, at a meeting of the Party’s Central Military Commission on 4 January 2019, Xi Jinping emphasised ‘the need to prepare for military struggle’ 做好軍事鬥爭準備工作]. In fact, talk of ‘The Great Struggle’ has been a feature of official discourse since the Nineteenth Congress of the Communist Party [in October 2017], although not in such an extravagant and repetitious fashion as now [the timing of such militaristic talk was not accidental; it is part of the psychological warfare Beijing continues to wage on Taipei. Only days before the meeting of the Party’s Military Commission, Xi made a major speech on Taiwan]. It is a major issue deserving of considered analysis, in the first place because of its impact on China’s domestic political scene, at the same time it has an impact on the nation’s interactions with other countries and global politics in general. People should not forget that for over thirty years the power-holders imposed a pitiless philosophy of class struggle through constant political movements. During those decades not only were the butchers themselves sacrificed on the altar of ideology, mourned in turn after others had been mourned for, but more importantly the countless multitudes of China were caught up in the maelstrom. It feels like only yesterday that bloody violence swept the land. Having barely survived that calamity you can just imagine how people must be reacting to the renewed drumbeat of war. The word ‘Struggle’ weaves through this threnody. People can only imagine the worst, for the drumbeat signals an end of talk of peace, and presages but rather civil war [since the renewed jingoism is aimed at Taiwan, part of Beijing’s ongoing refusal to rule out the use of military force to occupy the island, which it claims as part of its People’s Republic]. At times of crisis, a state of emergency is the Red Empire’s default posture [such a crisis being the economic problems besetting the country in 2018-2019]. It’s a ‘killer app’ they turn to in response to any major threat. The calls to ‘Liberate Taiwan’ or ‘Resolve the Taiwan Issue’ are like a Sword of Damocles hanging over us all; once chanted the domestic atmosphere tightens overnight, international relations become strained as the sword may be drawn from its sheath — but these are merely the basics of the ‘Philosophy of Constant Struggle’. As I have said in the above: China has not been, needs not become, should not and cannot itself be a Red Empire. And that’s why it must not allow itself to be sidetracked yet again and return to the path of the past. The reality is that in any normal society or political environment contradictions and clashes, complaints and clamour are commonplace. The true art of politics is knowing how to deal with such things in a peaceable manner that can bring people together. Clashes that unfold around [irreconcilable issues of] political contestation invariably lead to violence and rivers of blood flow in their wake. Time and again we have seen that only constitutional democracies have the stable political wherewithal to resolve conflicts peacefully. [In China] If only after the ‘First Year of Popular Rights’ [that is, the year 2003, when there was a glimmer of hope that a modicum of political relaxation might presage gradual reform] that already marked the first peaceful transition of Party power [with the ‘selection’ of Hu Jintao as Party General Secretary, the first time in China since 1949 that the political succession was not determined by a coup or a purge], a few more such transitions occurred and their format regularised so that a normal style of political contestation could mature within the framework of constitutional democracy ensuring that ‘the people are sovereign, the public vested with power’. If people were confident that a kind of Chinese-style stable and gradual transition would unfold, they could have understood and been willing to wait. Tragically, instead we had ten long years of ‘Harmony’ [under Hu Jintao and Wen Jiabao, that is from 2003 to 2012], years in which the political mantra was ‘drag it out’; nationwide demands for significant change were simply delayed. That window of opportunity available during those years that offered a space for some form of political uplift or historical advance was, time and again, ignored. Instead the power-holders blathered meaninglessly and played a game of ‘passing the [political] parcel’. The backsliding originating in those years was only a prelude to the kind of vast backsliding that we have witnessed over the past five years [from the Third Plenum of the Eighteenth Party Congress in November 2013 to now]. Although time has passed in impotence, the [urgent and existing socio-political] dilemmas have not disappeared along with it; on the contrary they have only been further exacerbated. Nonetheless, at least everyone is aware that no matter what happens, China cannot return to the past state of civil war [on the occasion of his seventy-third birthday — 26 December 1966 — Mao congratulated himself on the fact that the country was in a state of ‘all-out civil war’ 全面內戰]. No more ‘mucking around’ [折騰 zhéteng; a colloquialism used, uncharacteristically, by Hu Jintao with the meaning of ‘side-tracked’, ‘to be unsettled’. For a discussion of this term see Heritage Glossary]! Although [the leaders of the Hu-Wen era] didn’t have the internal fortitude to forge forward politically, at least they weren’t stupid enough to behave too outrageously. For their part, they were happy to operate their ‘Nine-man Oligopoly’ [at the time the Standing Committee of the Politburo had nine members] while the Red Gentry divided up the spoils of the nation among themselves; at the same time they gave license to the masses to pursue their petit-bourgeois dreams, thereby ‘filling the belly and softening the will’ [實腹弱智, short for 實其腹, 弱其志, from a famous line in Laozi’s The Tao and the Power 道德經: ‘The Taoist rules by Emptying the Heart-and-Mind/ And Filling Belly,/ By softening the Will to Achieve,/ And strengthening the Bones’ 虛其心, 實其腹, 弱其志, 強其骨, trans. John Minford]. People on both ends of the spectrum conspired, dreaming their different dreams despite sharing the same bed. Who would have thought that in the nationwide frenzy of corruption they actually managed to paper over the gimcrack structure [of the party-state]; it even flourished and generated a level of ‘moderate prosperity’ which, however, was ‘all appearance and no heart’. And now, in the blink of an eye, the first five years [of Xi Jinping’s rule] have passed during which an Anti-Corruption Movement has been used to shake up the bureaucracy and deal with the problems that accumulated over the previous years. It might have been brutal but it can claim a measure of success. But overall, things have gotten worse and that is because there has been a steadfast refusal [by the leaders] to engage with political mechanisms that rely on democracy and the rule of law. They have consistently rejected the fundamental aspiration of the age, that is to allow people to express themselves politically via the ballot box. There has been a trenchant dismissal of pluralism and [a refusal to allow] the expression of divergent opinions. And, furthermore, it is this very state of repression that has made it possible [for the Party] to abandon ‘the peaceful transfer of the throne’ [禪讓 shàn ràng, an ancient term denoted orderly power transitions between rulers, used here to describe the handover of party-state power first between Jiang Zemin and Hu Jintao and, again, a decade later with the retirement of Hu Jintao and the elevation of Xi Jinping, although the latter did involve a power struggle with Bo Xilai and a dramatic political purge]. And now, here we are, reciting the mantra of ‘Constant Struggle’ again. Even now, that same window of opportunity [mentioned above] exists even if in only the most tenuous sense. It could be slam shut in a flash and its loss could even hasten the further deterioration of things, so much so that it could hasten the reinstitution of the mechanisms of terror germane to that ‘philosophy of constant struggle’. And, along with that, the murderous machinery that kept it all running would once more come into operation. If things really unfold in that way, the common people will be reduced to being mere spectators as the party-state becomes embroiled in its own internal struggles [here 七鬥八鬥, literally, ‘to struggle seven or eight times’, a reference to the Cultural Revolution slogan: ‘constant struggle will create a revolutionary new world’ 七鬥八鬥, 鬥出一片新天地]. But the people are also hostage [to the system] and despite all of the hard work they have done to ensure themselves a happy life, ultimately won’t they also then end up as a kind of human sacrifice that ends up being buried along with it all!? So, what’s brought about the present situation? Of course, the personality of He-Who-is-in-the-Driver’s Seat [again 當軸, that is, ‘the drive shaft’, or Xi Jinping] is a factor, but the crucial this is the system itself. That is to say, a system that insists on maintaining a ‘Five-in-One’ dominance [that is, by the merging of party and nation 黨國一體, party and government 黨政一體, economy and government 經政一體, army and government 軍政一體 and army and ruler 君師一體]. For such a system that has squandered all leeway yet is determined to undertake a draconian purge [of its own corruption] means that those in power [orchestrating the purge, that is Xi Jinping and Wang Qishan] must devote themselves entirely to maintaining the kind of high-pressure environment that in turn threatens the stability of the whole system [and the minute they let up, the inertia of the system will reassert itself]. The irony of the situation is that for the system to be maintained, harsh measures amounting to nothing less than a purge [of the kind witnessed during the Anti-Corruption Campaign] have been necessary, yet even then there is no viable way ahead, in particular rational alternatives that could contribute to any kind of modern political transformation [discussed at length in the previous essays] have been rejected. An irony certainly, but also a reality. Once more we are contemplating the same kind of contradiction [that existed over a century ago] regarding the ‘Great Qing Dynasty’ and ‘China’ [that is, as the dynasty reformed people debated was the dynasty ‘China’ and was ‘China’ the same as the ruling Qing dynasty? Or, to cast the paradox in today’s terms: is the Communist Party’s party-state coterminous with China itself, and vice-versa?]. We find ourselves moving along knowing full well that what lies ahead is a dead end. We have no choice but to wait until we reach the end, and no one knows when that might be. It’s the kind of knotty problem eventually faced by all of the totalitarian regimes in the twentieth century. It was the kind of dilemma faced in the end by Soviet Russia, a hopelessly impossible situation that could only be resolved, or at least ameliorated, by the introduction of constitutional democracy [and the dissolution of the Soviet Union and re-assertion of Russia]. To do otherwise means you simply keep on going until it all came apart at the seams. Of course, in the process of waiting it out, you find yourself under the dead weight of a sclerotic system and you end up throwing millions of innocent lives into the ditch, part of a grotesque human sacrifice. The root cause of all of this: again, it is a refusal to accept the kind of sustainable political legitimacy offered by constitutional democracy. You respond to political crises by making economic concessions [to the population], by employing increasingly repressive measures and by blatant deception. Under no circumstances are you willing to concede power to the people. But here you are today: the size of the economic cake is smaller [and you don’t have the wherewithal to offer further state largesse, economic concessions, incentives, tax bribes, etc, to bribe people] and competition for every slice is more intense than ever. You are left with only the other two choices [that is, increased repression and deception]. So, let’s just see not only what will do, but what you can do.